The Ravenna covers collection from classic accessories combines a striking style with durability, fade-resistance and convenient features. Reinforced padded handles make removal easy while double-stitched seams add strength and a stylish accent. Structured vents stay open to prevent wind lofting and mildew and are lined with mesh barriers. 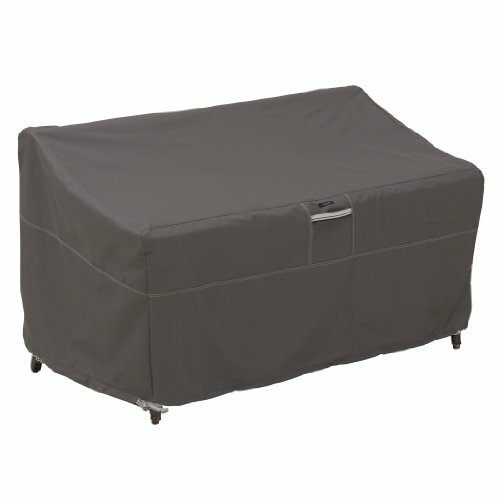 Water resistant backing keeps your grill dry while elastic hem cords move easily through a special channel for a snug fit. The adjustable webbing belts slide easily for a tailored look and four custom-colored buckles will keep your cover secure in any weather. Striped webbing adds an attractive accent and is unique to the Ravenna collection. With its adjustable hem cords and linked buckles, the Ravenna cover will fit snugly and will protect for years. 4-Year limited warranty.